I’ve been thinking a lot lately about adding a sniper to my Imperial Guard warband. Thematically I think it ties in nicely with them, particularly if I decide to try them out in Kill Team. Admittedly there’s something about the idea of snipers that makes me slightly squeamish; the thought of someone lying in wait far from the intended victim, turning the act of killing into a clinical process of mathematics, wind speeds and angles. Plus there’s the fact that by its very nature it’s unexpected. One second you are buying bread, the next you’re brown bread and there’s not a whole lot you can do about it. If you’re planning to murder me at least have the courtesy to do it to my face! Anyway, having bared my soul regarding my slight fear of snipers, I still thought that one would be a fine addition to my guard. After all being a sniper is one of those things that an unaugmented human can be perfectly good at. Take a modern military sniper and transpose them to the 41st millennium and they’ll still be at the top of their game. The toughest, most ruthless soldier in any other part of the military however would probably be just about qualified to do a space marine’s laundry. Don’t get me wrong the guard aren’t useless it’s simply that against the horrors of the far future you need to be more than just handy in a fight against other humans (that’s why the Emperor made space marines in the first place). After all, the species which have survived for ten millennia against the Imperial war machine aren’t to be trifled with – an Ork wearing only its y-fronts still beats most humans hands down and even a grot would give you a nasty bite. Anyway, hardly had I come to the conclusion that I needed a sniper in my life than I received a bitz drop from the inimitable blogger and hobbyist IRO. What did I find lurking in amongst it but this sharpshooting lady from Victoria miniatures. I’ve often looked at the Victoria Miniatures range in the past but never got around to getting anything, so a big thanks is owed again to IRO for the extremely timely gift. Indeed he actually painted a version of her himself recently so if you just can’t get enough of admiring this miniature you can check out his version here. Rejoice, rejoice! If you own any bells now is the time to ring them! 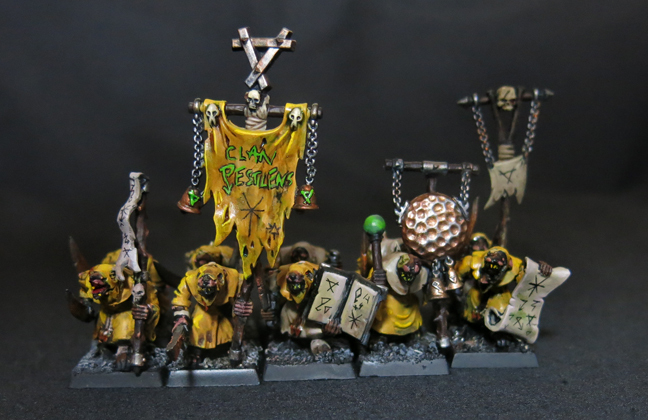 The ugly plague monks are done at last! I’ll admit that by the end I was sick to the eye-teeth of them and more than happy just to call them done. The result of this is, sadly, that they’re not the best painted models in my collection, but then again they’re not the best sculpted models in GW’s catalogue either. I will however happily meet them half-way, if they make me some better plague monks I’ll put more effort into painting them. I used a bit of greenstuff to make this one look even more diseased and to break up the otherwise rather flat and bare surfaces, with mixed results in my opinion. 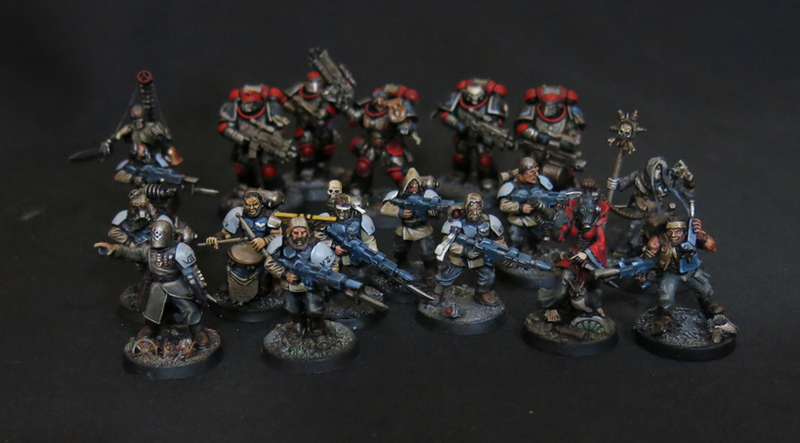 Here’s the whole unit, complete with banner, musician and Bearer of the Word (although if that’s what a Bearer of the Word looks like these days Lorgar has really let his standards slip…). The way units rank up in Warhammer means you can’t actually see all of them that well but to my mind that’s actually something of a blessing. Solid progress, I hope you’ll agree! Now arguably the rats didn’t quite make it under the wire for Azazel’s Junit challenge, sneaking in last night which is technically July, but I don’t think Azazel’s that strict and anyway I’m just glad to get them finished. Certainly I wouldn’t have had the push to finish them, at least not for a while, without the challenge so, as I’ve been saying here regularly over the last little while, Azazel deserves another resounding “thank you” from me for conjuring and shepherding these little excursions of collaborative encouragement. Two units that definitely did meet the Junit criteria however were my Space Marines and Imperial Guard squads. When I posted the marines last week I realised I was pretty unhappy with the highlighting on the acting sergeant’s legs and, although you were all too polite to comment on it, it pained me sufficiently that I went back and gave him a quick repaint. Again hopefully you agree that this is an improvement. And, whilst we’re turning our attention away from fantasy rat-men and onto the defenders of humanity in the far future, I realised after I posted the most recent two guardsmen that I hadn’t added a group shot of the whole squad so here they are, the completed (J)unit of rag-tag serfs, plus a Catachan who’s still on the phone. Indeed, by way of a pallet cleanser after struggling with the monks, I went ahead and kitbashed another addition to the Guard regiment. I tend to try and keep updates to a theme but as this one is proving to be very much a grab-bag of general updates, here’s a couple of WIP images of the newest recruit. I know there are a lot of Chaos and Ork models garrisoning the shelves of my house but humanity need not loose hope whilst this little lot stands in their defence. 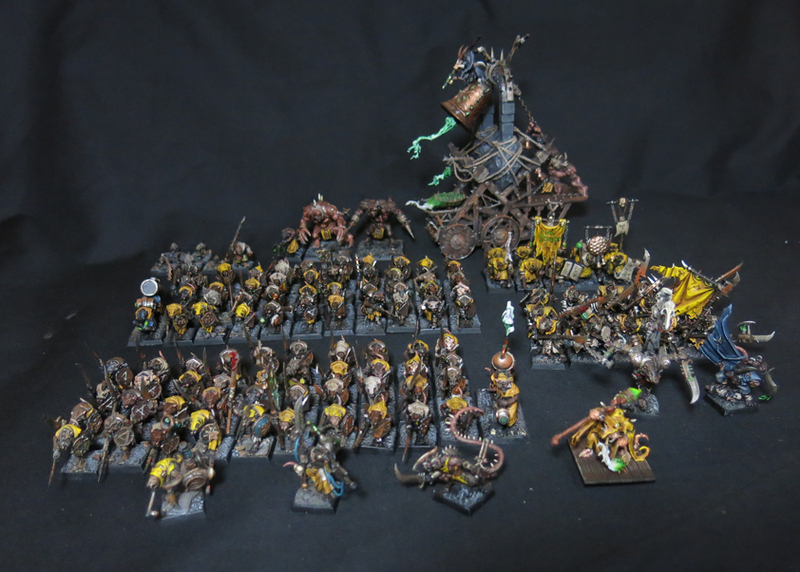 Having seen the progress that the Skaven army has made in 2018 it occurred to me that it would also be worth taking a look at all the other things I’ve painted this year so here they are, every model I’ve finished in 2018 (minus the Skaven as that made everything too confusing, and also not including the little gang of genestealer infested civilians that I sent off into the northern wilds in search of Big Boss Redskullz). It’s not an unimpressive pile either if I may say so myself, with everything from plague zombies to unicorn-men, and goblin warbosses to skull-faced birds putting in an appearance. Sadly there’s still only one painted Necromunda ganger in there but expect to see that situation rectified over the next few months. Of course that’s not all I’ve got planned so here’s to plenty more projects over the next six months! For a long time I’ve dreamed of commanding a huge Imperial Guard army, capturing my vision of what human wars in the 41st Millennium are like. Alongside an equally vast adeptus mechanicus host, a few squads of space marines (truescale obviously) and perhaps a unit or two of custodes, would march a vast horde of human soldiers. Each would be personalised, converted into a unique character. Alongside them would roll the massed armour (even though painting tanks holds no appeal to me at all) and other warmachines, towering knights, squads of ogrens and so on. However so far common sense has continued to assert itself. Rather than rush out and spend all of my meagre earnings on guardsmen when I already have a horde of other unfinished projects demanding my attention, I’ve tried to keep it small scale, building up a squad, model by model. Perhaps it’ll grow in time into a platoon, then – maybe – a second, until one day I look round and find myself with an army waiting to march on my command. A few days ago I added a couple more guardsmen and, finding that rather than satisfying the creative urge this only exacerbated it, I’ve painted up another one. In addition I went back to the medic I showed last year and made some adjustments, improving his paintjob and tying him into the slowly growing collection. I suspect that for now I’ll be setting the guard aside and turning my focus elsewhere again but before we move on here’s a quick look at some of the other models I’ve assembled who will, in time, make their way out of unpainted morass and into the ranks of the Hammer of the Emperor. 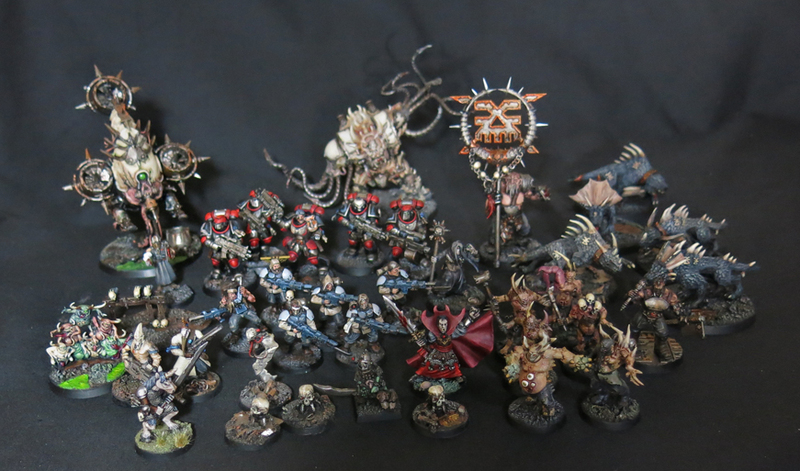 And of course before we depart the guard entirely however there’s always room for another group shot of progress so far. Back at the tail end of last year I took my first steps into assembling the Imperial Guard regiment I’ve always imagined. 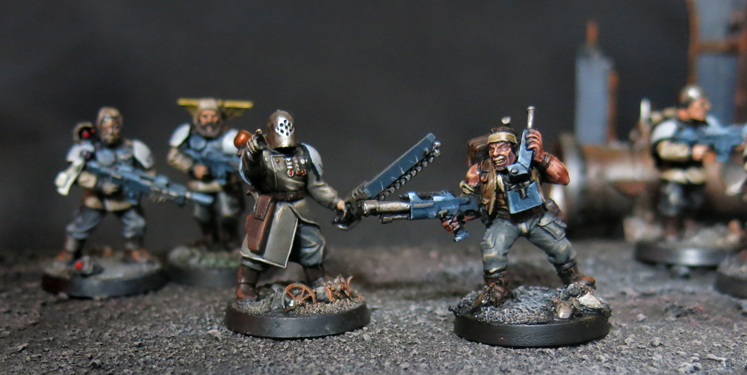 Inspired by the Iron Sleet Invitational I put together a little band of guardsmen capturing the aesthetic I’ve long associated with the Guard, and yet which rarely comes across in the official models. I even waxed philosophical on the topic if you’re interested in reading more about my reasoning. At the time I made four guardsmen and, hitting something of an inspirational dry spell, rounded out the squad with a specialist agent sent to the Thorn Moons by the Imperial invaders. However that left several unfinished guardsmen sitting on the corner of the desk, neither fit to be included in the group nor ready to be cast back into the bitsbox, but waiting for inspiration to return and raise them up as fully finished models. Feeling the call of the guard once again I grabbed one of those unfinished miniatures and gave him the additional touches needed for him to join the Imperial war-machine. I see him as very much a devout soul who, believing he has been called to serve in battle as part of the Emperor’s great plan for humanity, has requested dispensation to leave his allotted labours in the manufactorums and join the Guard. The fellow members of his congregation, believing that his mission is a holy one, have gifted him the small icon from their church to carry into battle, hoping that this will ensure his protection until he has completed whatever task the Emperor has set before him. Of course this isn’t my first experiment with the Imperial Guard. A while ago I put together this chap as a “proof of concept” to test the waters and iron out some of my ideas. Given my return to the guard I took the opportunity to give him a quick repaint to bring him into the ranks of my new squad. And yes, I know I’ve got paint on the rim of his base and, due to the selective blindness that seems to affect me whenever I do this, I overlooked it. Don’t make me go and take the photos again, just trust me that I’ll get it fixed. It’s mostly at the back, nobody will notice right? Whether this has been enough to cure my urge to paint guardsmen and let me focus on other projects, or if this is only the beginning of a mass recruitment drive remains to be seen. 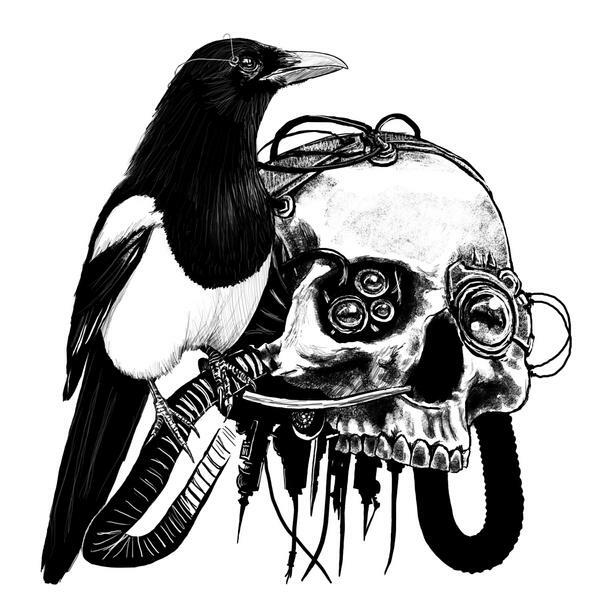 In the meantime any thoughts or feedback are very welcome.